Boasting lovely wooded and seasonal mountain views, comfortable interiors, cozy outdoor spaces, a soothing hot tub, plenty of games, a fantastic master suite, and a location just a few miles from downtown attractions, restaurants, and shops in Pigeon Forge, it’s easy to fall in love with Casa di Amore at Bear Creek Crossing Resort. 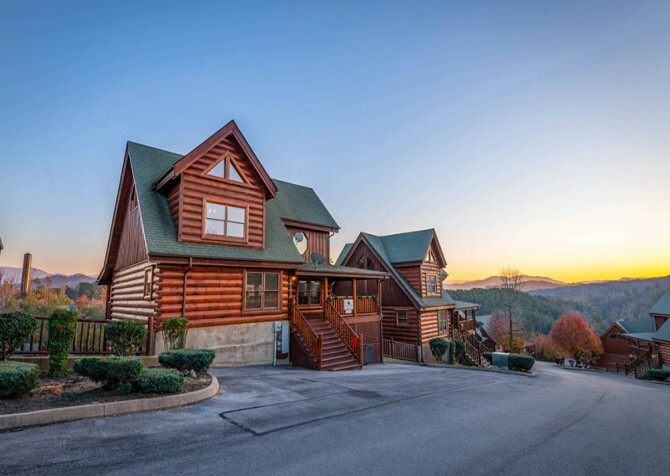 This 4-bedroom, 4.5-bathroom, pet-friendly cabin with room for 12 guests is a top-notch cabin rental, offering the peacefulness of a mountain home plus entertaining amenities for all ages on your group getaway, be it a family trip, couples’ retreat, or vacay with friends! Sip morning coffee in the rocking chairs, play air hockey and pool all day, splash at the community pools, host popcorn-filled movie nights with the big screen TV, and slip into one of 4 king-size beds every evening. 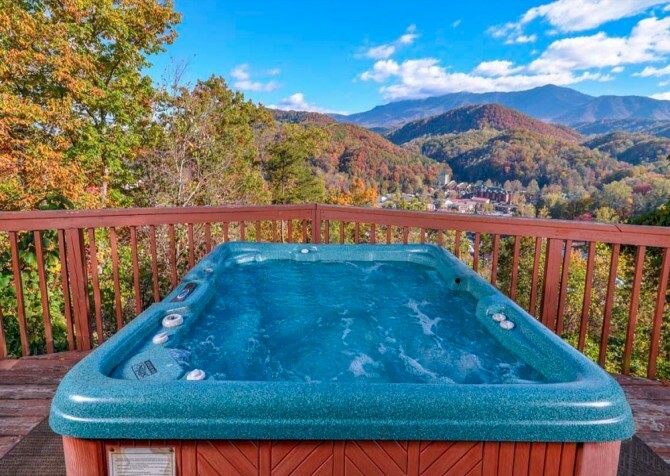 Ah, nothing but good times await at Casa di Amore in the Great Smoky Mountains! In the main living area, 3 armchairs and a comfy couch flank the electric stone fireplace and widescreen plasma TV with booming surround sound, perfect for epic action flicks or jumpy thrillers! Large windows surround the space, letting in tons of natural light, brightening the room and bringing lovely views indoors. There is also a large coffee table and a lamp, so you can curl up with a good book or play board and card games on a cool Smoky Mountain night inside. This inviting space is ideal for watching ball games, enjoying movie nights, drinking rich cocoa by a toasty fire, and chatting with family and friends before heading to bed. Groups will also appreciate the fully equipped kitchen, furnished with glossy, black appliances, a stainless-steel double sink, and beautiful wooden cabinetry. This open space has all the tools and dishes you'll need to cook meals in the cabin or whip up midnight snacks. Brown morning bagels, fry scrambled eggs and crispy bacon, brew endless pots of joe, store leftovers in the fridge, pop movie-night treats, blend peppermint milkshakes, and switch on the dishwasher for easy cleanup. Just off the kitchen lies the dining area, harboring a large table for 8 with a chandelier overhead and a bright window nearby. Set the table with provided dishware and get ready to dig in! This space is also quite versatile and can be used for planning the day’s activities, crafting with the kids, checking the Cabins for YOU blog for local events, and so much more. Need more dining space? The living area is right around the corner, so you can enjoy a show while you dine yet be within earshot of juicy conversations. After meals, head to the rec room for a ton of fun! Gorgeous wood walls and ceiling shape this great game room, while the large windows frame picturesque wooded views. Step into the exciting space and prepare for a gaming battle royale — with air hockey and pool tables! While shamelessly challenging family and friends, enjoy shows and ballgames on the mounted flatscreen TV. Should the games get a touch too heated, flip on the ceiling fan to cool down, and if the chilly mountain air is a bit too much, the electric stone fireplace will be there to save the day. Need a break from your victory streak? Grab a cold one and a few munchies from the kitchenette, complete with a mini fridge, microwave, and stainless-steel sink. There’s even a table for 2, armchair, and plush sofa that provide ample seating for those looking to chill. Ready to hit the hay…in style? Head to the elegant master suite upstairs for some romance and relaxation. Refined furnishings, a vaulted ceiling, and bonus amenities combine to elevate the space — with an open-room jetted tub, a private en-suite bath, TV, top-notch views, and an electric fireplace. 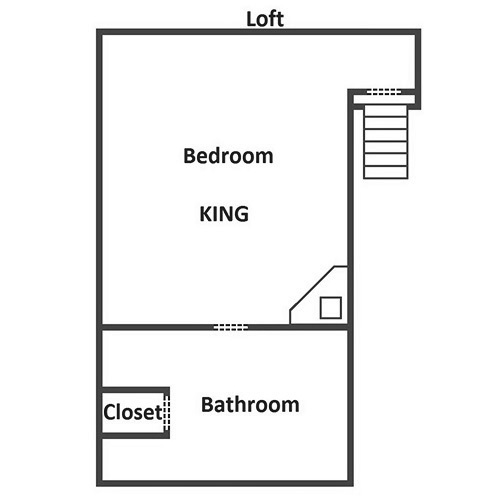 Casa di Amore is also home to 3 additional bedrooms (2 on the lower level and 1 on the entry level), each featuring a king-size bed and TV. There are also 2 queen sleepers in the cabin, meaning even more guests can join you in the Smokies! 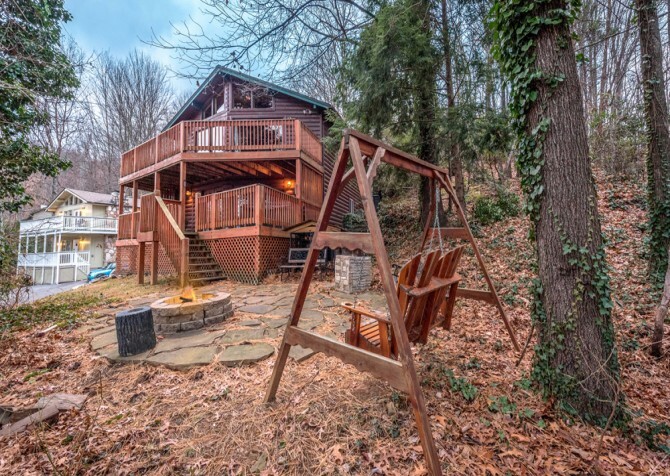 The outdoor spaces at Casa di Amore are also relaxing, harboring rocking chairs plus tranquil wooded and seasonal mountain views (best seen in cooler months). Sit back with a cup of tea or a glass of wine before taking a dip in the bubbly hot tub or grab your favorite magazine and enjoy a subtle sway with the latest trends on the porch swing. There’s also a gas grill, so you can make burgers, hot dogs, and your favorite grilled meals for the whole group. 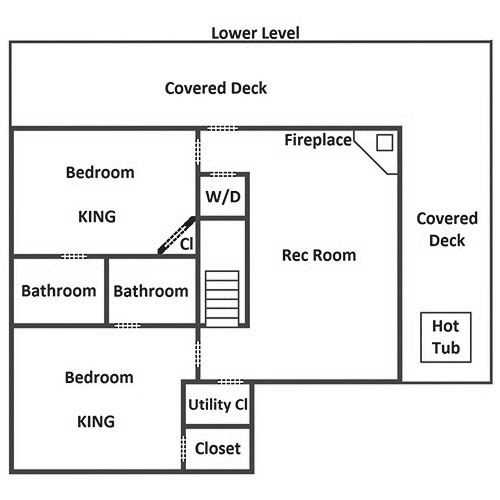 With 2 spacious decks, this Pigeon Forge cabin provides plenty of space for every guest to enjoy the great outdoors! And parking for 2 is paved and motorcycle friendly, so you can unleash the hogs for a wild (and safe) ride in the mountains. Looking for more? Our thoughts exactly. And Casa di Amore is here to deliver — with a prime location in Bear Creek Crossing Resort! Play Marco Polo at the indoor and outdoor community pools, and traverse charming nature trails. 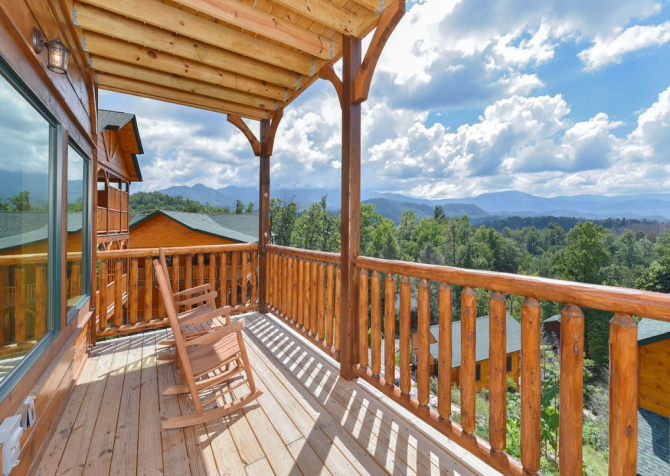 This pet-friendly cabin is also the perfect place to bring Fido for your Smoky Mountain stay! And the provided washer and dryer plus high-speed wireless internet keep the comforts of home close at hand. Casa di Amore is convenient to the popular attractions and shops of Pigeon Forge, just over 5 miles away. Spend the day browsing the Tanger Outlets, catch a dinner show, or play miniature golf, laser tag, and arcade games. The Parkway is also home to go-kart tracks, local shops, and dozens of restaurants — plenty to keep a whole group entertained for a weekend or a whole week! Step back in time at the Titanic Museum Attraction, where you become a passenger and see what it was like to travel the frigid seas. Pass friends in a go-kart race, beat the highest arcade scores, soar to new heights on the SkyFlyer, and aim for the kiddos on the blaster boats at The Track Pigeon Forge! Filled to the brim with exciting rides, mouth-watering restaurants, sweet-tooth-curbing candy shops, and souvenirs galore, The Island is great for a full day (or five) of fun! 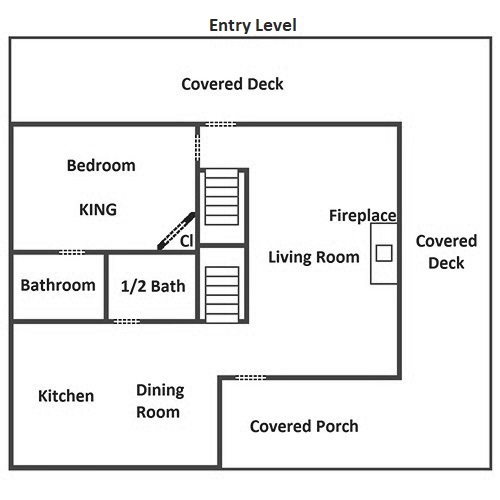 What's in a cabin location?